You can listen to 'I'm not the same without you' here. 31 Years ago I bought 'The nightfly', on vinyl, as there were no cds yet. And no matter what people might say, I haven't heard a cd version sound better, warmer, than my old elpee. 31 Years is a long time. Donald Fagen hasn't made a better album since. Not solo and not with his companion Walter Becker in Steely Dan, until 2012 that is. Sunken condos may not be better, but definitely is competing as a serious contender. This album has that very same under the skin, creepy crawley kind of swing that has every limb moving. It works from the very first to the very last note and it does not seem to have a filler like 'The nightfly' did have. 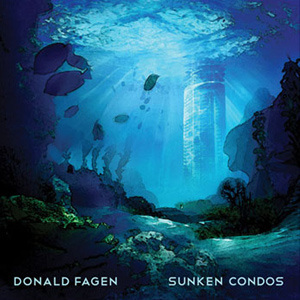 As all Donald Fagen's and Steely Dan's good records Sunken condos is an amalgam of notes, harmonies and layered music and arrangements making up a simple sounding but intricately difficult song. I just love it. The album is in the familiar jazzy, very soft-edged blues style that has become Donald Fagen's trademark over the years. Of course there's nothing new here, perhaps in some nuance, but this is the music we have come to love listening to 'The nightfly'. A clean, soft drum sound lays down the foundation for everything happening on the album. The soft bass seems one with the drums, right in sync. The rhythm guitars and supporting keyboards, all is there to let the unexpected happen. The choruses that sound like they come sliding in, just like gliding on ice after a long run to gain speed, each turn smoother and slippier. With the same amount of danger, as if it is possible to slip and fall vocally also. All other sounds are solos and embellishments. From everywhere sounds escape the whole. A horn section or lone trumpet here, a loose guitar note, the background singers that move up front, a sprinkling of piano notes. All intricate and exactly fitting. It makes listening to Sunken condos with the headphones on so much fun. There remains something to discover with each spin of the record. Together with Michael Leonhart Fagen has put so much care into details that there is enough to study for years for who wants to reproduce the songs later. Layer after layer of instruments are stacked onto the sound and who knows how many parts were scrapped during the arrangement and mixing process. The album kicks off with the laidback groove of 'Slinky thing'. The mix is such that the whole range seems filled. While all else still has its space in the mix. Like drawers being pulled out of a closet and then closed again. There's always the presence of the drums, brain wide. The tempo goes up in 'I'm not the same without you'. About as rocky as Donald Fagen gets these days. The funky guitar aids the tempo with its bright sound. The Stevie Wonder like harmonica solo, played by Will Galison, surprises and fits so good. Clean and funky. And than all the glitzy horns in the back ground. There's a lot going on. Every song has these distinctive features that make them stand out, like the un-Fagen like rough guitar in 'Weather in my head'. If there was any critique on Sunken condos I read, it's about the cover of 'Out of the ghetto'. Too white. If you do not know the original, like myself, all you hear is a great funky track. A totally Donald Fagen song, so perhaps it's also a compliment that he takes this song to his own.